We operate primarily by appointment so that there is ample time for all patients and scheduled surgical procedures. Occasionally appointment delays are inevitable due to emergency cases. Please understand that we make a sincere attempt to see each client on time. For your protection, and that of others, all dogs must be on a leash (free leashes provided at our entrance area) and properly controlled while in the waiting area or exam rooms. All cats must be in a cat carrier or on a leash. As of November 1, 2016 we have new Appointment Policies which include Cancellations, Late Arrivals and "No-Shows". We kindly ask that you notify us by the morning of your appointment that you need to cancel. Appointments are in high demand and this allows us to offer that appointment to another patient for timely medical care. To cancel, please call 716-366-7440. We understand that cancelled appointments happen for a number of reasons and that some are unexpected and unavoidable. Late arriving appointments may be asked to reschedule if the veterinarian's schedule cannot accommodate you. Priority is given to patients that arrive on time. If you choose to wait, the wait-time may be considerable and unpredictable. Clients that do not cancel their appointment and do not show up at their appointment time are considered to be a "no-show". We reserve the right to charge a "no-show" fee of $20 unless you call and give notice by the morning of your appointment. We require full payment at the time of services. 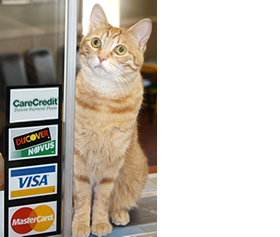 We accept cash, check, Visa, MasterCard, Discover, and Care Credit. We do not sell or give out any information to any other person(s), third party vendors or internet businesses. By providing your email address to our clinic, we do reserve the right to email occasional newsletters from our clinic or any of our affiliated businesses. No private information will ever be disclosed to outside parties. If you require a person or persons that are not registered with us as a co-owner of your pet(s), please provide written instructions with permission given to that person(s) with your signature and date. As per NY State statutory and regulatory provisions: Records may be disclosed (1) upon written request of owner and a fee may be charged, (2) when a veterinarian suspects and is reporting animal cruelty, abuse or neglect, or (3) when a veterinarian reasonably believes disclosure is necessary to protect the health or welfare of the animal, a person, or the public.